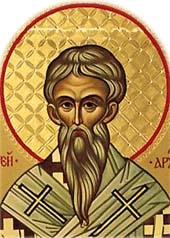 St Andrew of Crete (c. 660-740), was born in Damascus. He become a monk at Mar Saba, still a young one. Monk at the Holy Sepulchre in Jerusalem at the age of 15. Sent to Constantinople by Patriarch Theodore of Jerusalem in 685 to accept the decrees of the Council of Constantinople. He stayed there as head of an orphanage and a men's home for aged. Deacon at the church of Santa Sophia in Constantinople. Archbishop of Gortyna, Crete c.690. Noted and eloquent preacher, he wrote Greek liturgical poetry and many idiomela (short hymns). May have introduced the Byzantine litugical hymn form known as kanon; his Great Kanon, a penitential Lenten hymn, is still sung in the Byzantine liturgy. His works display not only great rhetorical skill, but a depth of theological understanding possessed by ever fewer in these latter days.